In 2014, 19 percent of the U.S. population lived in a multi-generational household, according to Pew Research Center data. Whether it’s a cultural norm, financial struggle, or need for child care assistance, American families are increasingly living with three generations under one roof. In fact, the number of Americans living in such households has risen by 9.1 million from 2009 to 2014. If you’re a baby boomer, you may be anticipating becoming a multi-generational household — or you might already be living in one! Either way, if you have a basement, you’re outfitted with a great option for multi-generation living with the privacy each family needs as well. Oftentimes, the basement is thought of as a cold, damp place relegated for storage. However, it can be a warm, functional living space if it’s done right. Just because it’s below ground doesn’t mean it has to be an afterthought. And in this case, it can even act as a guest house for the people you care for most. To create a home away from home for your kids and grandkids, make sure your basement has these six things. Floor heating might seem like a luxury when you’re talking about a master bathroom, but in the basement, it’s a necessity. What are the two words that most people use to describe basements? “Cold” and “dark.” They’re cold because they have a concrete subfloor, which is excellent at absorbing heat. To avoid this issue, the homeowner should install cork or synthetic cork underlayment with electric radiant heat installed on top. The underlayment will prevent the concrete slab from stealing the heat from the radiant heating system, leaving nothing but warmth behind. Plus, a radiant heating system will emit enough warmth that you can choose any flooring material you want. You don’t have to go with carpet to add warmth to the room. Whether you pick wood or even tile flooring, the floor-heating system will keep your feet and the rest of the space feeling comfortably warm. Because “dark” is the other word most commonly used when referring to basements, lighting is an important feature. By having can lights installed, you can maintain the height of your ceiling while adding enough light to give the illusion that you’re above ground. To give each family some privacy, a kitchenette is a nice option in the basement. It’s always helpful to have an extra oven for holiday parties and other events anyway, so incorporating one into a bar area downstairs is a great feature to have in any basement. Plus, when you have a family living in the basement, it gives them the opportunity to have their own, private family dinners when they want to. Add a fridge and sink, and they’ll be completely equipped. An absolute necessity for a basement being used as a guest house is a full bathroom. You don’t want your guests to have to come upstairs every time they need to shower or use the bathroom. Having a full bathroom downstairs is sufficient for a family of any size, and will make the basement seem like their own private residence. This one might seem obvious, but your basement should have at least two bedrooms with closets to make it usable for a family. Bedrooms in basements don’t count toward a home’s total number of bedrooms when it comes to resale, so it’s really up to the homeowner how they want to construct the room. However, making the room look as close to a bedroom upstairs is the key to making it feel homey. A built-in closet will offer the space your guests need so they don’t feel like they’re living out of a suitcase. Finally, any good basement should have an open living area for entertainment. This space can be modified as needed, depending on the occupants. It can be used for watching TV, as a play space for kids, or for weekly poker nights. The options are endless, which is what makes this space so great. 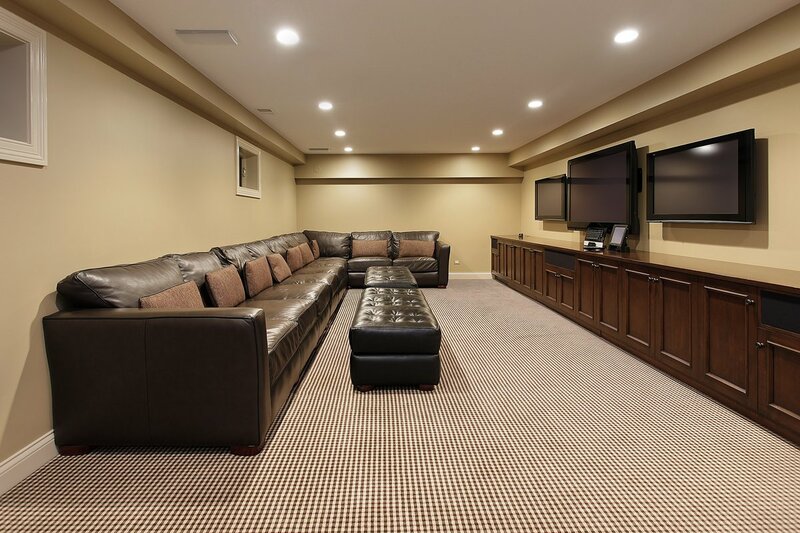 By adding these six things to your basement, you can create a welcoming, comfortable, private home for your family. And even after they move out, you’ll be left with a functional space for parties or out-of-town guests that will only add to your resale value. It’s a win-win!